On Friday, April 2nd, 2004, the heart of Jim McClure stopped beating ending his time on this earth. Yet his legendary exploits as a Harley Davidson Dragbike fuel bike pilot will live on for all time. This is the legacy earned by one very hard working man once referred to as Jim “Da Judge” McClure. Jim McClure always had a passion for Nitro Harleys. “Gasoline is for washing parts, alcohol is for drinking and nitro is for racing,” Jim would say. Jim was born January 31st, 1942, in West Union, West Virginia, the son of a man who worked both construction and ran a saw mill. As Jim grew to manhood, he made up his mind one day he’d move on from the hills of West Virginia and seek what life had to offer. Jim graduated high school at age 17 and by his 18th birthday he joined the United States Air Force as an aircraft mechanic. During his years in the military, becoming proficient with all things mechanical, Jim took a part time job at a Tidewater Harley Davidson dealership in Newport News, Virginia, and his love of motorcycles blossomed. Too much knowledge and skill for one photo – dragbike legends Elmer Trett, Jim McClure and Larry McBride. Jim McClure’s love of Harley Davidson motorcycles was second only to his love for his wife of 36 years, Phyllis. As a racing team, they were a formidable pair in a house built on love. Jim only had eyes for Phyllis and for his beloved Harleys. Together they barn-stormed the USA from around 1970 till Jim’s passing in 2004. There’s no telling how many thousands of miles they traveled together on their racing adventures that not only brought them coast to coast on many occasions, but all the way to Australia in 1989 and to the United Kingdom in 1996 as well. They did it all and they did it together. Jim and Phyllis met as a result of a motorcycle crash that landed Jim in the hospital in 1965. While there in recovery, Jim met Phyllis and by the time Phyllis got home from meeting Jim in the hospital that night, there was a telephone message waiting for her on her answering machine. From that day forward, they took on the world together. Jim McClure in his first year of drag racing on asphalt, in the 1979 season became the first class champion for Pro Dragster and was awarded the very first #1 plate for P/D with the DRAGBIKE! sanction. Chris Rasile photo, taken in 1980 by Chris Rasile. Around 1970, their racing efforts began in earnest in dirt drag racing at race tracks in Virginia like Tater Run, Thunder Road, Slade’s Raceway in Surry, Virginia, and Green’s Raceway in Dispuntanta, Virginia. Jim and Phyllis racked up the wins where ever they chose to race. In fact when Jim retired from dirt drag racing a race promoter came and bought back a very large collection of Jim’s trophy’s he and Phyllis accumulated from close to ten years of winning at dirt drag racing. The man needed a trailer to haul away all the hardware! But by 1979, Jim had turned his sights onto asphalt as a new opportunity and he quickly became a force to be reckoned with. Jim began motorcycle drag racing in the fuel ranks burning nitromethane for the first time entering competition in the class “Super Eliminator.” This was widely regarded as a stepping-stone class to Top Fuel class racing. Jim’s time in S/E was short lived though as in 1980 he stepped into a new class created by the DRAGBIKE! sanction known as Pro Dragster. That year Jim ended the season by bringing home the number 1 plate cornering his first national championship. As you can see by the signature “Life Begins at 170!” sticker on Jim’s starter cart, this is a very old photo from an early 1980 photo archives back when Jim first started drag racing on asphalt. Phyllis made sure the batteries were always topped off, and the priming cans were ready to go. This Overkill motor was delivered to Bobby Spina and was one of the initial production runs of the motor in the early 1990’s. Note the Overkill SRC stamped into the drive side of the case indicating Jim’s collaboration with Shumaker Racing Components of Van Wert, Ohio. Jim’s Overkill creation with Shumaker, sported a one piece crank shaft and a pair of billet aluminum Funny Car type connecting rods, allowing the motors to withstand greater loads and live longer. The Overkill motor played the pivotal roll in Jim becoming the first naturally aspirated Nitro Harley to break the 200 MPH barrier in October of 1995. Cracking the double duce for miles-per-hour is a common occurrence with today’s T/F Nitro Harley Davidson type bikes, but without Mr. McClure’s innovation in the early 1990’s there’s no telling where the class would be today. Jim was also the first T/F Nitro Harley racer to run independent left and right side fuel injection intake systems. I recall seeing Jim at AMA/PROSTAR races in the mid 1990’s with not one, but two separate throttle bodies facing in opposite directions at a right angle to the centerline of the chassis – another McClure innovation in fuel racing. This photo was captured at the AMA/PROSTAR World Finals in the early 1990’s. Bobby Spina (L) had just won the race, but Jim McClure (R) has just won another of his nineteen championship titles in T/F Harley. Sometimes in drag racing, the after parties are better than the drag racing. Jim’s racing innovations and winning ways were forever changed in early 1997 when Jim was competing at an AHDRA event and his Top Fuel bike misfired after launch resulting in an engine explosion that lifted both cylinders from the engine block. The blast was so violent that the upper assemblies of his motor impacted his upper chassis, driving the frame against the center of Jim’s chest, lifting him several feet off the bike. His chest trauma was so great that if not for the work of emergency medical services, Jim would have died that day. The lasting results of that fateful day are that every Top Fuel Harley to this very day are required to have engine restraint systems to help contain a catastrophic engine failure. Also, drivers of Nitro Harleys are required to wear ballistic chest protectors. Jim’s chest trauma was so bad, his heart was bruised severely, and it never fully recovered. Being the tough hard working man he was, dedicated to Nitro Harley racing, Jim pushed on. Later that year, in December of 1997 Jim was back on the bike racing again. Then in 1999 Jim suffered a top end crash during shut down that signaled a time for change in Jim’s racing program. He wasn’t ready to stop racing but it was time for him to stop driving the drag bike. Jim McClure was always a showman as well as a racer, he knew what the fans came for and he was happy to deliver. Jim’s sponsors like Primo Rivera, Accel, ART were important to Jim and he served them proudly. So in 1999 Jim and Phyllis started looking at potential new drivers and they settled on talented veteran nitro pilot Mark Conners to drive for them. They competed with Mark in the hot seat beginning in the year 2001 and raced with him until a point in the 2002 season when Jim’s heart problems became to complex for safe travel. Jim’s health was a constant battle stemming from complication incurred from his chest trauma in 1997. In 2003, doctors inserted a mechanical pump into Jim’s chest because the damaged heart was failing. This put Jim on a transplant list living day to day with fingers crossed. On New Years day, 2004, Jim got his new heart. While medical science has come a log way over the centuries, it’s still not an exact science and in life, well there are complications. The heart transplant did not take and Jim’s body rejected the new heart right away. Jim’s doctors and Phyllis did everything humanly possible to help him but the good Lord called Jim home on April 2, 2004. During his close to thirty years of motorcycle racing, there’s no telling exactly how many track records, sanction records, or national records were actually set and broken by Jim McClure. We do know he did win 19 number one plates with various sanctions: Phyllis McClure kept mighty close track of them and she holds those memories very dear. 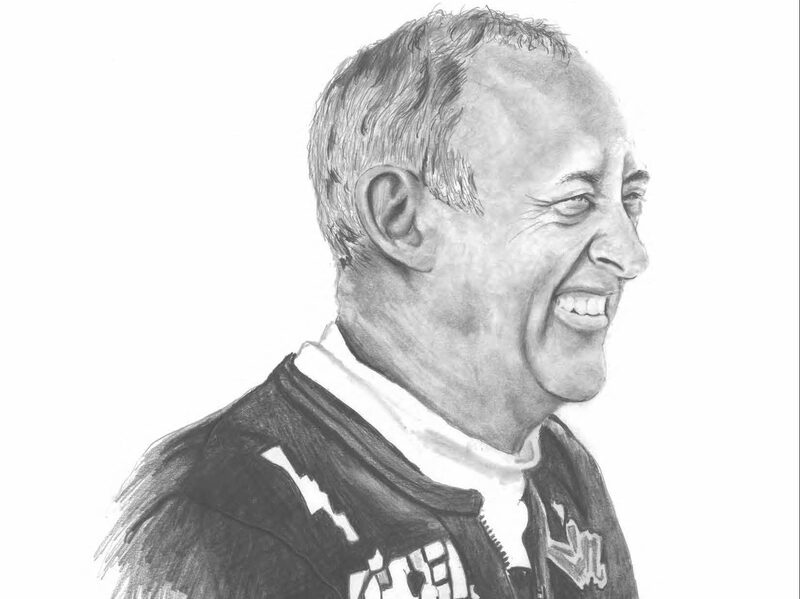 What Phyllis also has is what she shares with us all, the recollections of one of the toughest men ever to race in Harley Davidson racing history. When Jim McClure left the dirt drags and came to the black top, he came to win and win he did. One could argue his wins were his greatest achievement or his creation of the Overkill motor, but this would be short sighted. Jim’s greatest achievement was his love and devotion to that which he loved most, his wife Phyllis and Nitro Harley motorcycle drag racing. Jack Korpela interviews Phyllis McClure at an AHDRA event dedicated to her late husband at Virginia Motorsports park in 2006. Jim and Phyllis are rightfully enshrined in the AMA Museum near Columbus, Ohio. Godspeed Jim “Da Judge” McClure. Thanks for the memories. I meet Jim back in the mid 90ies at Napierville Quebec Canada drag strip and had no idea he was such a huge force in the Top Fuel harley drag bike world. His bike wasn’t able to deal with the rough conditions that day but was always ready to answer any questions I had about his wild motorcycle. Had no idea he had died from riding his machine. Phyillis,Your Husband was to me the best friend a biker could ever had.He and Wes took great care of my bike so much so it is still up and running.One time Jim was at HRHD with his bike and he let my son sit on his bike(He is now 25 and yes he rides as do I)when I asked him if I could get on the bike Jim said NO!!!! because he said I would TRY to RIDE IT,No way but i WOULD SIT ON IT WHILE IT’S RUNNING!!! !THANK YOU FOR ALWAYS TREATING EVERYONE LIKE FAMILY!!! !LONG LIVE DA’JUDGE!!!!! I met jim inn whittier California at Rivera ing. A buddy of mine Gary Watkins was working there they were rebuilding his motor on his drag bike. And was there for the testing. Man talk about loud. That was in mid 90’s but that bike was awesome.at the time he was up there in age and i couldn’t believe this man was the one who was taming this monster. A story to keep telling. Sorry to hear of his passing. I met Him back in the mid 80’s when I was running a pro gas here in Virginia , a great man who was a mentor to me and always had time to talk and critic anytime he was asked , he will always be missed and he will always be in my heart !